I'm typing this entry on my phone because the wireless internet isn't working in my bedroom, and I don't really want to go sit in the living room with my brother who smells like cigarettes. I've been sitting on my bed cycling my wireless conection for the last two hours to no avail. I've also been watching White Collar, so I'm not that lame. Right? I decided against getting those leather pants, btw. Lily is right - they are just too much right now. I've seen some at H&M for much cheaper, and I'm hoping to pick up a pair of those on my next trip to SLC. I'm not sure why, but I am obsessing over pretty much anything and everything leather right now. I was able to procure a number of lovely new things though, all of which will be featured in upcoming posts and most were on my wish list. I'm really excited about every piece that I got, and there are a couple that I seriously regret not getting, but I'm trying to limit my spending. I am so, so tired. Work was rough today, and I was already feeling a bit under the weather. People tell me I push myself too hard, but not the people who matter... and regardless, it never feels like it's enough. I just have so much I need to get done. Who has time for sleep and/or a social life? I've worn really cute outfits the last two days, and I'm really disappointed that I didn't have a chance to take pictures of them. But tomorrow is Friday, and then it's the weekend, and I refuse to waste another two days off being dormant again. For right now, though, I'm going to go wash my face and go to sleep. 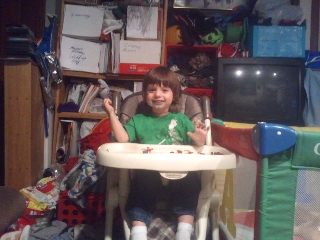 For now I will leave you with this adorable picture of my nephew post ring pop. He's blue! VistaVapors is the best electronic cigarettes provider out there.